The first draft of my recent Ghost Rider article for Back Issue had a much more extensive history of the character, including all kinds of minutiae and boring plot details of nearly every comic in which he appeared. (Cheap plug: A list of all those comics was provided in my last blogpost.) Much of this was due to an overly slavish response on my part to an editorial request to include everything. Thankfully, this directive was not as absolute as I had originally interpreted, and I was given a chance to clean up the article upon rewrite. Still, as long as I had this material written and it wasn’t going to be used in the article anyway, I thought it might be good fodder for a blogpost. As it turns out, I think this could prove to be a fascinating snapshot of the creative atmosphere at Marvel in the early Bronze Age. 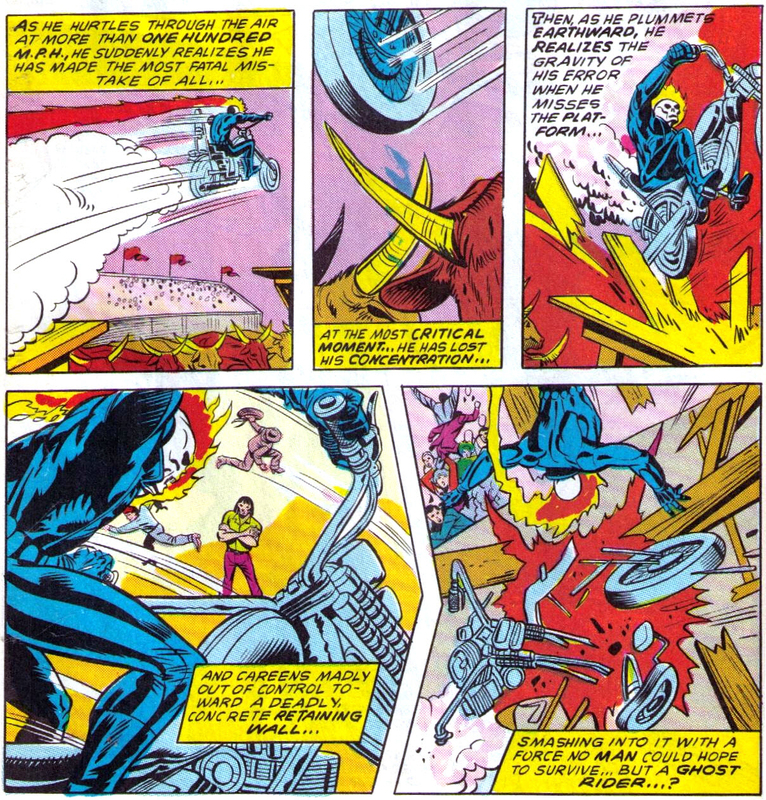 Ghost Rider debuted during a chaotic time in comics, particularly so at Marvel. Editorial oversight barely existed at all at the House of Ideas, a problem that seemed to just get worse as the line kept expanding and all the editors-in-chief kept quitting. In researching my Ghost Rider piece, it became clear that writer Gary Friedrich’s tenure on GR might be one of stronger examples of just how much these problems affected (at least some of) the published product. Friedrich is a co-creator of Ghost Rider, having started as the credited writer of the character’s first appearance in Marvel Spotlight #5. The first couple of issues were fine, but then a new supporting character was introduced—a very minor character in the grand scheme of things, but his introduction would be the first sign of larger continuity problems creeping into the strip. Marvel Spotlight #7 featured the first appearance of Bart Slade as the road manager of the Simpson Cycle Show; a character clearly intended to be a romantic rival of Johnny’s for Roxanne’s affections. He was also shown with a cane at various times, which I think (and this is a total leap on my part) was originally meant to indicate that he was a former rider in the show that was injured somehow. 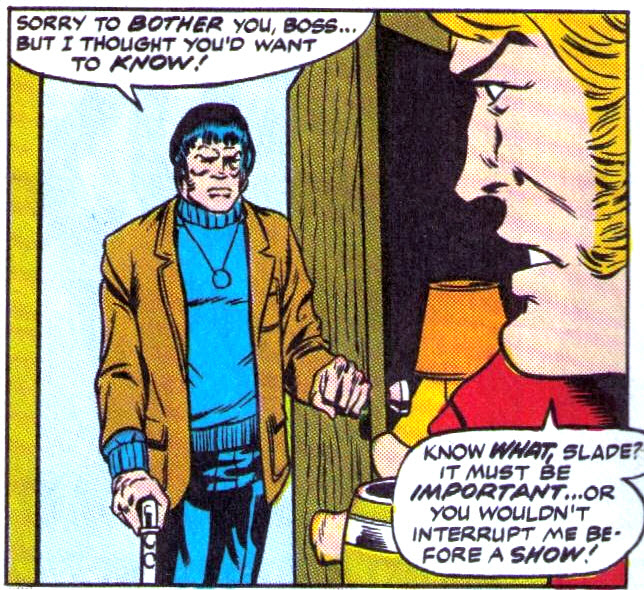 He appears with the cane in one panel here; then the cane mysteriously disappears in another panel on the next page. Now you don’t. Ploog drew Slade’s hand like there should be a cane in it, but looks like someone erased it. But this was a minor thing, more amusing than exasperating… if this was all there was. 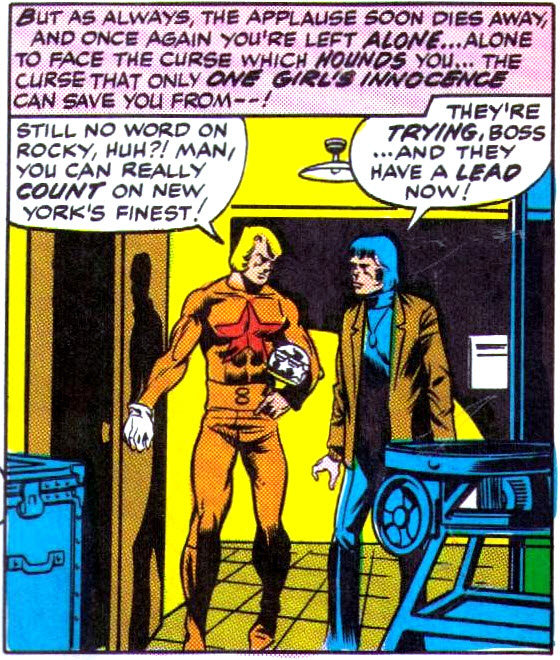 As I said, there are probably very few people out there who have any recollection of Slade at all, so it’s not like he’s a major part of Ghost Rider lore. But the treatment of this otherwise forgettable character was the first of many creative cracks in the foundation of the strip. Upon their arrival in Arizona, Johnny runs afoul of a Native American named Sam Silvercloud, who doesn’t want Johnny to make the jump, feeling it will somehow commercialize the area and lead to more land being stolen from his people. This eventually leads to Ghost Rider battling the “medicine man,” Snake Dance, out in the desert. We end on the (nearly literal) cliffhanger of GR’s cycle blowing up (thanks to tampering by Sam Silvercloud) as he’s in midair over the canyon. The motives for the villains here are rather weak. Instead of fighting some injustice that’s already been done, they’re fighting over an injustice that’s just a possibility at this point. Yes, the cycle jump might lead to future land grabs, but then again it might not. It’s quite possible that the attention brought by the jump could be an economic boon—jumpstart tourism, bring more general interest to the area. Problems that are only potentially such and not yet real don’t make very solid motives for murder. Also, for those keeping track, Slade’s cane reappears this issue. The next issue (Spotlight #9), things get crazier. First, the cliffhanger from the previous installment is resolved by having Ghost Rider’s life saved by Satan. The dark lord’s logic: Had Johnny Blaze died “by the hand of another mortal,” Satan would miss out on his soul somehow. So Johnny/GR is basically immune to death under any other circumstances except by Satan’s hand—and even then, the conditions have to be just right. Knowing this as a reader drains a lot of potential drama and tension from the strip. Again, I assume we can take this to mean Slade was once a stunt rider before being injured somehow. But this is never solidly verified in the actual story at this point; nor is the extent or nature of his injury; nor the specific circumstances around it. For all we know as readers, Slade could be a delusional madman who’s never even ridden a bicycle before. Adding still more to the confusion, Slade once again appears without his cane and seems to get along fine without it. Johnny then returns to the cycle show just in time to stop Slade from riding out in his place. “You couldn’t jump a sawhorse with that bum leg of yours!” Blaze says. As he’s performing, Blaze/GR laments that Slade, “the man he once called his best friend,” appears to have turned against him. He then attempts a stunt involving a jump over a bunch of cattle and crashes. After surviving the crash, he spies Sam Silvercloud in the crowd and runs him down, demanding to know where Rocky is. Sam tells him she’s being held captive back at the reservation. Much of this is made more perplexing by the way the art fails to match up with the writing. The way it’s drawn, it would seem Silvercloud had something to do with Johnny’s accident at the show—logical enough, given that he tampered with Johnny’s bike previously in an attempt to kill him. But nothing in the text indicates that this is what happened. Instead, Sam is just there hanging out and watching the show, which makes no sense. Shouldn’t he be running back to Snake Dance to let him know that Blaze is somehow still alive? As opposed to just standing there, waiting for Blaze to spot him? In fact, in the next-to-last panel of the page, right before the crash in the final panel, we see Silvercloud standing there with his arms crossed—as if he’s not at all surprised by the events unfolding. It also appears that GR is looking right at him. I think the artist set it up this way because the writer’s original intent (or so the artist, Tom Sutton, interpreted from the plot he was given) was for GR to spot Silvercloud in the crowd and realize he’d messed with the cycle again. It appears there was room left for this to be noted in a thought balloon or possibly a caption, but instead the text ignores what the art is clearly designed to emphasize. Sam Silvercloud appears singled out in the next-to-last panel here, but the text doesn’t make any note of him at all. This is one of the downsides of the Marvel Method of plot-art-dialogue. It could be that Friedrich forgot his original plot when it came time to do the dialogue; or that he decided to change the plot after the art was done; or maybe Sutton misinterpreted the original plot when laying it out. In any case, the issue ends with another showdown with Snake Dance, as Roxanne is threatened with becoming a human sacrifice for the second time in nearly as many issues. Snake Dance is putting on a show for his followers, having these venomous snakes bite him and then biting Rocky. In the text, it’s again hinted here that SD may not be so evil and may not have intended to kill Rocky; that, in fact, he was planning to administer an antidote after having her bitten… but isn’t this rather reckless? If not flat-out stupid? Okay, so first off, SD’s powers are never clearly defined. His only real powers would seem to be the ability to project illusions and maybe hypnotize people; but then we see him survive the snake bites here. Unless that was just an illusion too. But if it was, why not use your illusion powers to fake Rocky’s snake bites as well? Why have her bitten by real snakes with real venom if you don’t truly want to kill her? For that matter, how come he didn’t need any antidote after having been bitten himself (assuming he was truly bitten)? While I have no direct knowledge of what was going on here, I would speculate that Friedrich had a change of heart between the time he submitted the plot and then got the art back to do the dialogue and captions. I say this because if you examine the story with the volume off (that is, ignore the text and just go by the pictures), you see a one-dimensional villain doing evil things because that’s what villains do. I believe this was the gist of the original plot. Snake Dance’s more noble intentions, expressed almost exclusively in text, feel tacked on. Thus I think Friedrich added this later, either to give the villain some layers, or maybe he did it because he realized that casting Native Americans as total bad guys wasn’t working. (Historically speaking, they are the wronged parties, after all.) This may have been a good impulse on Friedrich’s part, but without redoing some of the art to fit the changes, the story gets messy. Spotlight #10 opens with GR rushing Rocky to a hospital to save her from the venomous snake bites. In the wake of this, back at the reservation, Snake Dance’s followers (led by Sam Silvercloud) turn on him and try to lynch him. At the last second, SD is saved by his daughter, Linda Littletrees, who also happens to be the fiancée of Sam Silvercloud. (So Silvercloud was on the verge of murdering his prospective father-in-law.) Sam justifies the near-lynching by accusing SD of attempted murder—which is just a tad hypocritical, to say the least. When Linda points this out, his response is that he’d “forgotten how cute” Linda is when she’s mad and forces a kiss from her(!!). This gets him a well-earned slap in the face from Linda. Back at their home, Snake Dance has an antidote for the snake venom, but is suddenly no longer interested in sharing it, declaring that through Rocky’s death, their people “once again will know greatness!” Talk about turning on a dime. But Linda grabs the antidote, rushes to the hospital (thinking to herself, “Master… if the girl dies… our cause is lost!”), and winds up saving Roxanne’s life. After learning Rocky’s last name is Simpson, Linda recalls an incident fifteen years prior when Rocky’s father, Crash Simpson, then a motorcycle cop, saved her as a little girl from being hit by a truck.